I naively thought that I could know it all. All the programming languages and all the ins and outs of web design. I’m an idiot! Wouldn’t it be nice if someone took all the pain out of building a website? Well, that’s what WordPress said they did. So we started building websites with WordPress. In truth, WordPress tried, and succeeded for the most part. WordPress is by far the best content management system, but the problem with WordPress is the need to constantly update the software due to hackers finding exploits, and the incessant need by the developers to create a “better,” “cooler” product. Everytime they update the software, you have to hope your website, with all the changes you made to it, will work on the new version. If not, you are forced to “fix” the issues by delving into the CSS and the code. The problem is: what happens if a “fix” you made to a site doesn’t work in the next version of WordPress, or the one after that? Not only do you have to fix it again, but you have to recall what you did to fix it the first time. Now that may all sound like an impossibility, but, believe me, I have seen it first-hand more than I care to remember. Add in the fact that as we moved clients onto WordPress, and WordPress updated, we had to “fix” these sites. When Wordpress updated every month, guess who got to “fix” 45 sites overnight. If you have never experienced the joy of trying to explain to a client why their website keeps breaking every month, you really should try it! It’s better than exercise. Nothing is more motivatingly futile than that. I thought there had to be a solution to the issue, because web design companies across the planet had the same problem. It turns out, several people were working on the solution. WordPress came out with a child theme option, and several people started testing what it could do. One of those was Brian Clark of Copyblogger fame. He was having the same issues we were all having everytime WordPress updated. Except, he only had one site to worry about (probably): Copyblogger. It turns out, that you can create a base template, known as a theme, in WordPress that has the basic styling and functionality a website needs. Then, you can make a child theme that uses the base theme as a foundation for building your site on. What this does is separates the base styling and functionality from the web site’s design. That way, when WordPress updates, you only have to update the base theme, now known as a framework, and your website will never break, or look wacky in a browser again. Just one problem though. Someone has to update the base theme (framework) whenever there is a WordPress update that breaks it. That’s where Brian Clark and Studiopress Genesis come in. Brian and his team of developers used the learnings from their experience with Copyblogger to create another company called Studiopress, and sell the base theme, they call the Genesis framework, and child themes which can be installed on top of the framework. This makes web design much, much easier! That said, the themes look nice out of the box and have really great functionality. If you are interested in looking at the themes and the options Studiopress Genesis offers, visit them here using my affiliate link. While we still do custom web design work, we customize WordPress themes. You don’t want a website that isn’t WordPress. It’s better and easier to optimize for SEO, it has a backend in which anyone can add content. It connects to other services using plugins. You can change it to your hearts content. To think, we used to have to make all this stuff from scratch! True, we don’t have maintenance work like we used to because now people can update their own websites if they want. Not all of our customers want to, but they have the option. 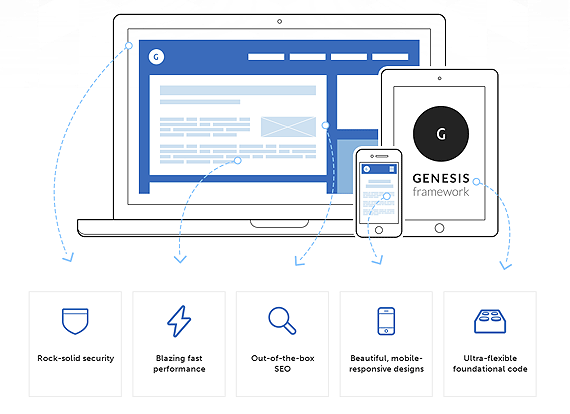 While WordPress completely changed how we do web design, Studiopress and their Genesis Framework made it easy, repeatable, customizable, and profitable. It’s a no brainer!